The research group identified the SD1 (SEMIDWARF1), as a key gene responsible for the deepwater rice's response. The SD1 encodes a biosynthesis enzyme of gibberellin – a plant hormone. The gene orchestrates the deepwater rice response via a unique gain-of-function allele. When submerged, rice accumulate ethylene, a gaseous plant hormone. Deepwater rice amplify a signaling relay in which the SD1 gene is transcriptionally activated by an ethylene-responsive transcription factor, OsEIL1a. 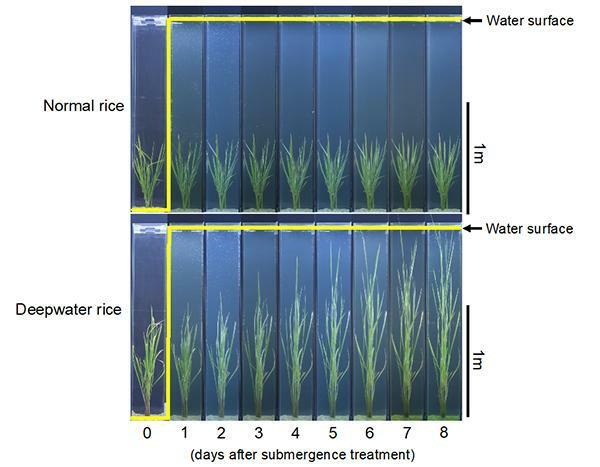 A transcriptional gain-of-function allele of the same gene enables deepwater rice to adapt to flooding via the opposite phenotypic response – an increase in plant height. The ability of SD1 to function in such diverse roles in cultivated rice highlights the inherent plasticity of plant response to its environment.